Make it seven in a row. 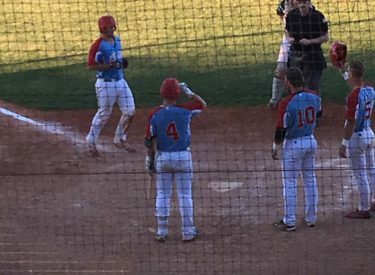 The Liberal Bee Jays won their seventh consecutive game Sunday night 10-4 over the visiting Great Bend Bat Cats. Kyle Schmidt launched two home runs and drove home five runs in a 3-4 night. Jake Harrison (3-0) pitched six innings allowing three runs, striking out eight without a walk. Chance Carner pitched a scoreless seventh, Zach Zeller allowed one in the eighth, and Lowell Schipper worked a scoreless ninth. For the first time in the series, the Bee Jays scored first. Great Bend walked the first two hitters before Cale O’Donnell singled home a run. Liberal plated two in the fourth. O’Donnell doubled and Garrett Scott doubled. Colton Onstott’s sac fly made it 3-0 and Jaron Robinson’s singled made it 4-0. The Bat Cats scored three in the sixth against starter Jake Harrison to make it 4-3. But the Bee Jays answered. Onstott walked and Robinson doubled. Then Schmidt blasted a three run homer to left. Brenon Rhodes then singled and Caleb Ward walked. Chad Kennedy drove home a run with a single. Onstott singled to lead off the seventh. Schmidt lofted a towering homer to left to make it 10-3. Chad Kennedy was 2-2 and reached base all five times. Cale O’Donnell was 3-4 with two doubles and two RBI’s. Liberal is 10-3 and Great Bend is 5-9. The Bee Jays have Monday off and play at Oklahoma City against the Indians Tuesday, Wednesday, and Thursday at 7 on 1270 and kscbnews.net.